How do we do that? How do we “show forth the praises”? 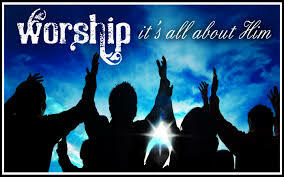 While it is true that we can and should worship God by ourselves, we should also worship Him when we are together. The verse quoted above is written with the plural forms of the words. Showing forth the praises of God is something we do together. God has promised that whenever we gather together in His name He will be there. (Matt. 18:20) We gather together expecting Him to be there according to His promise. The community together responds to him in worship, by declaring that he is worth all honor and praise. In most Christian churches of today, the Sunday service/meeting is the time designated for and as worship. The gathering looks quite different between liturgical and non-liturgical churches. However, the idea of worship is what drives both types of gatherings. I do not intend to suggest that one form is superior to the other. Since I am no longer a regular participant in a liturgical church, my comments and descriptions come from the non-liturgical perspective with which I am more familiar. Ravi Zacharias has pointed out that there are five basic elements to worship— the Lord's Supper, teaching, prayer, praise, and giving. Most liturgical churches have all five of these in some form, with teaching being relegated to a short “homily.” Most non-liturgical churches only have four, with the Lord’s Supper being an occasional part of the celebration. Ever since the Protestant Reformation and up until the past decade or two, the sermon (teaching) was the mainstay and the main event of the Sunday gathering for the non-liturgical churches. Regular teaching of God’s Word is taking more and more of a secondary place in our churches. On the surface, many will argue with me on that point; but let’s consider things from a historical perspective. When I first came into the things of the Lord (1969), the Charismatic Renewal (1965ff) was in full swing and the Jesus-People Movement (1971ff) was taking off. The Jesus People were providing the impetus the Charismatic Renewal needed to get outside the four walls of the church and into the streets. Church services were ordinarily 1½ to 2-hours long, sometimes even lengthier. Few people got upset with that, mainly because the presence of God was so palpable. The music and singing were part of the celebration, and everyone participated. Praise teams had not yet been invented. The teaching from the sermon could easily last an hour in and of itself. Not only that, but we also had Sunday night services with more praise and teaching. This gathering was not as well-attended as the morning meeting, but the experience was the same. This was the tail-end of the prosperous times after the war. We had now gone through the revolution of the tumultuous ‘60s and the fears of the Cold War. 1973 saw the oil embargo and our first major economic recession since the Depression of the early ‘30s. ABC introduced the Sunday Night Movie. Churches felt the effect of this as people found reason to stay home. By the time Sunday Night Football was introduced, most churches had already done away with their Sunday night services. Now, on a Sunday morning at church, it is not uncommon to hear a conversation about the upcoming games of the afternoon and evening—during the time set aside for honoring the Lord. The Sunday morning service has not only dwindled in attendance, but has also been diminished in time. An hour is about all that anyone can comfortably stand anymore. As a result, teaching has lost its centrality and its focus. That is a shame and is detrimental to our overall health and effectiveness as Christians. This speaks very strongly to the musical aspects of our worship, which I will pick up on next time.